I thought it might be fun if occasionally I gave you an update on what is happening in my various classes, and pull a favorite quote from each of the novel readings we are studying that week. I hope you don’t mind this deviation from my blogging norm. First I should introduce you to the term “dialectic journals” Students in all three classes (8th grade is excluded) are bemoaning the fact that I make them do this tedious chore. What is a dialectic journal you ask? It is notebook where students write down quotes from the book that they find significant – and then explain to me why they chose that particular text. Quotes can be selected for diction (eloquent word choice – which will help students become better writers themselves) – character development – theme development – possible foreshadowing (and what they predict will happen) – personal connections they see in the story – connections to other books and/or movies that they recognize – well, you get the idea. What students rarely realize is that this tedious chore is actually making them responsible for their own learning. Hopefully they will end the unit more confident in picking up any work of literature to discover meaning for themselves. Well, now that you have had a mini-lesson on dialectic journals, let me introduce the classes. I absolutely LOVE his quick wit! “…But I don’t think it is social to get a bunch of people together and then not let them talk, do you? An hour of TV class, an hour of basketball or baseball or running, another hour of transcription history or painting pictures, and more sports, but do you know, we never ask questions or at least most don’t; they just run the answers at you, bing, bing, bing, and us sitting there for four more hours of film teacher. That’s not social to me at all. ….. They run us so ragged by the end of the day we can’t do anything but go to bed or head for a Fun Park to bully people around, break windowpanes in the Window Smasher place or wreck cards in the Car Wrecker place with the big steel ball. ….. I am finding that more and more students just want to be told the answers to the questions; they don’t want to have to think for themselves. The incidents of road rage and school shootings has skyrocketed in the 21st Century. I find these words of Ray Bradbury written over 50 years ago to be quite sobering. 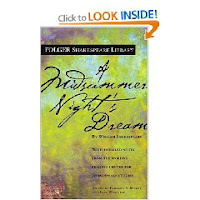 In 8th grade English we are starting to block the scenes for a final performance of A Midsummer Night’s Dream in May. Due to snow days, we are not as far along I as had hoped. We have just started working on Act I scene i when Egeus demands that his daughter Hermia be forced to marry Demetrius (she, in fact, loves Lysander) or to be killed. (as a side note – I will say that the 8th grade girls learned to appreciate their fathers after reading this). Finally, the 7th grade class has just started reading The Hobbit. We spent a large part of first semester studying Fairy Tales. Students learned how to discuss “literature” by reading several common fairy tales and answering questions regarding characters, setting, plot, conflict/resolution, and theme. Students even wrote their own “fractured” fairy tale – which is always fun to read. We then read the novel, Tuck Everlasting, and at the end of the book discussed whether this could be considered a modern-day fairy tale. I have never been fond of adventure – my least favorite Disney movie is Peter Pan for they always seem to be on the brink of death! I would much rather stay in my cozy little Hobbit hole (book nook) with my cup of tea, slice of cake, and a good book. So there you have it — a day in the classroom of Mrs. T. Thanks for stopping by! You must be the most fantastic teacher in your school. I hope you do more of these posts as I found it most enjoyable and I learned a lot. An apple on your desk today, Mrs. Totoro! I would love to be a student now that I appreciate all these great books! I am sure that many will come to love them now (there's always hope). Love the quote from P & P too. Looking forward to dropping in again Mrs. T.
I would love to be a student in your class!! I'd love to be in your class, Molly! It seems that Tuesday Teasers have become more of a dialectic journal for me… have gotten away from the random nature of it. I'm even wondering if I should stop linking and feature a "passage of the week' instead. BTW, that's one of my favorite quotes from P&P;, too. How fun. More this type of post, please! And I loved the fact that I recognized the quotes you used — especially in P&P; and The Hobbit. Love the update. And I would like to take your class. Wow, you sure do teach a lot of different classes! That's a lot of prep time! I don't know how you keep up. I wish I would have had you as a teacher in high school. I didn't get any of this. I LOVE that quote from Pride and Prejudice. Don't you just love the man? It is a wonder he hasn't gone mad, living with his wife and some of those daughters. I really enjoyed this, Molly – I hope you make this a recurring feature! Also, you're giving me the idea that I really should re-read Fahrenheit 451. I have never heard of a dialectic journal before, but it sounds like something I would enjoy writing myself. It would be ideal for blogging as the notes would already be there. Thankyou for sharing the books that you are reading at school. It must be difficult to keep track of them sometimes. I have been wanting to read Farenheit 451, for a while but can't seem to get it from the library at the moment. I might try and track it through Bookmooch. I love this post! As a future English teacher I love hearing what other teachers are reading with their students. WOW — I am thrilled that you like this type of post. I would be most happy to update on a semi-regular basis what I am teaching in the classes – particularly as it pertains to literature. You are all very complimentary of my teaching skills – and I am deeply humbled – but I am not sure that my students hold your high opinion 🙂 Mrs. T makes us work – and think – and WRITE. I am not necessarily a favorite among the student body. I will confess that this number of preps is somewhat daunting. The good news, howevever, is that I have been teaching these classes for about 3 years now, so while I am constantly evaluating and adapting my lesson plans – I did not have to start from scratch this year. Also, I teach at a relatively small private school (under 200 students), so my average class size is about 16 students — much smaller than the typical public school classroom. While this does not have an effect on the number of preps — it does greatly affect the number of papers that I have to grade (my true nemesis). Now I know that you know you have to continue with such wonderful posts. I haven't read Fahrenheit 451 but I really want to now. I was so excited to see your post about your classroom and so jealous about the books you are teaching! I love the idea of the dialectic journals. I use literacy logs in my classroom where the students have to write a letter about their independent reading each cycle. Oh, Molly, please keep these going. Your love of books and teaching comes through loud and clear in this post. You have such a passion for it all. Your post prompted me to do two things: order 451 from the library and look up the word dialectic. See, good teachers can't help spreading the love of learning wherever they are. I would love to be in Mrs. T's class. I think you would find me an engaged and dedicated student! Jenny – I truly have no idea which book I would choose to memorize; quite honestly, there are just too many that are worth saving. I am anxious to read the students' responses to this question at the end of the unit. Nicole and Margot – thank you so much for the encouraging remarks to continue with these kinds of posts. I think I will enjoy that. I think that by the time you get the kids in middle school, they are so used to being fed the answers, that they have gotten lazy. But kids are so much smarter than we give them credit for being. Keep pushing them! I blame standardized testing for a lot of this–teachers have to make sure the kids do well on these tests.